After nearly a decade of quiet, the Sun is waking up in a big way, and this picture from August 1 shows the most dramatic eruption yet, including a solar flare, a "solar tsunami," shifting magnetism, shaken corona, and more. The eruption sent several billion tons of charged particles hurtling towards Earth at 2.2 million miles per hour, or about 1,000 kilometers per second. Fortunately, the effects of the eruption are harmless, even positive, as the eruption's interaction with Earth's magnetic field created amazing aurora displays over the northern regions of North America and Europe. This particular solar flare falls in the moderate C-class category. Still, it is possible more severe solar flares will follow, which could disrupt our tech infrastructure both in space (such as satellites) and back here on Earth. 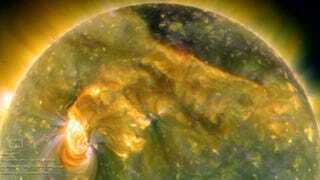 The image up top was recorded by NASA's twin STEREO spacecraft. Click the picture for a closer look.